This page last modified 2012-05-02 02:53:50. Spawned at 2PM Game Time ~ Location -1094.35,-734.74,-446.09. Good Luck on yours. 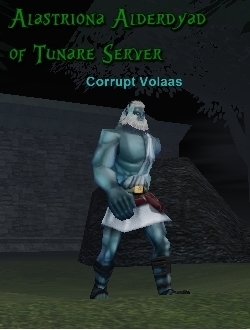 This mob is in fact Corrupt Volaas, not Corrupted, spawns and paths between the Hleyta fort and the river to its east (it may also spawn at 5pm game time, but spawned much later for me). Con yellow to a 65 druid and watch out he summons. Where does he spawn roughly?